Today is my hubby's oldest brother's 4th Anniversary of his ordination to the holy priesthood! He was ordained on the Feast of his favorite saint no less, Saint Rita of Cascia. To celebrate the feast of St. Rita, the children and I will be reading a brief story about her from the Picture Book of Saints, while we enjoy a tea in her honor. 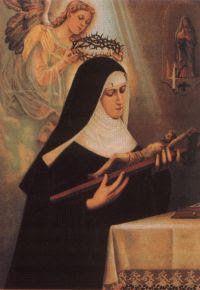 Saint Rita of Cascia ~ Pray for us! Beautiful beautiful beautiful...sort of a loss for words! But that is what comes to my mind when I read about the blessings in your family. Love the pic, very special day for him, how wonderful! =D I was sooo excited about her feast day! I think that's sooo AWSOME that your brother in law was ordained on her feast day! Have you seen the movie St. Rita?